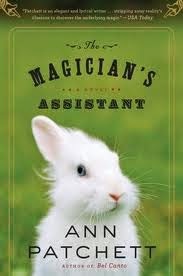 a book chick: "The Magician's Assistant"
my take: Ah, another great read from Ann Patchett. This was published in 1996, which doesn't seem like that long ago, but before the widespread use of the internet and cell phones, so the story is mercifully free of technological distractions, and explains, in part, how the magician was able to keep his illusion in tact. The book is about, yes, the magician's assistant. The story opens with the magician dying while getting an MRI ... and as the assistant grieves, she comes to find out who the magician really was and is able to decide who she wants to be. I loved this: vastly different from her other novels, well-written, memorable characters and plot. I love when we find a can't-go-wrong author. And fun that she can have such a variety of novels but they're all great. Need to borrow this one next time I see you. I just added it to my list.